This list is a work in progress. 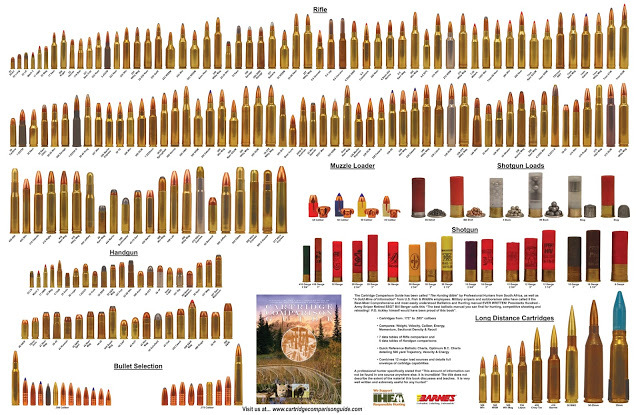 I have attempted to list every pistol and rifle cartridge ever manufactured. The list is huge and evolving. Please see our new improved lists for rifle, rimfire, pistol and shotgun ammo. These are expanded and separated by type. You can CLICK on each one for a full description. Forgot the 16 gauge, 20 gauge, 28 gauge and the .410 bore. Also the .55 Boys. Overall killer list. Thanks. Where is the .475 Linebaugh? Maybe I missed it. OK, Thank You! I will add it when I edit the list. You are missing the Eichelberger & Kolibri cartidges. OK, Thank You! I will add them when I edit the list.